Car shipping in October is easier than most months for the simple reason that less vehicles are being transported across country. By October, the college kids have all made it to their schools and no longer require automobile shipment services. If they haven’t gotten to school, they sure are in trouble with their professors because midterm papers are due right about now! Families relocating in the summer have also already done so. So the demand on truck space wanes as a certain parity envelopes the auto shipping industry. Roughly speaking, there is enough truck space available for the number of cars and trucks needing shipped just about everywhere. 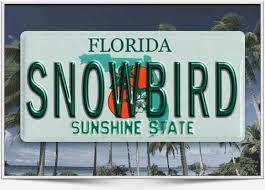 Not literally as the opposite is true, but figuratively, as the snowbirds start to say goodbye to the Northeast, Midwest and Great Plains states for their migration to warm weather spots such as Arizona, Southern California, Texas, New Mexico and most of all … Florida! Grandma and Grandpa are heading south for the fall and winter and we wish they’d take us with them. It is fairly manageable at first, but then the orders start to stack up heading to Florida, which has 6% of the total US population, but accounts in October for 20% of all vehicle shipments nationwide. And that’s just counting the vehicles heading to Florida, it is higher if the vehicles shipping from Florida are also included. So as our Mexican friends might say, Florida is the big burrito. Car transporters and carriers know only too well that they need to make their money heading to Florida because they might be heading back empty. That begins to drive the market price upward for car shipping to Florida. Sometimes it comes as sticker shock to the customer, who may have shipped another car elsewhere at a similar distance for far less. For instance, at this very moment there are on the national board almost 50 vehicles waiting to ship from Boston, Massachusetts to Miami, Florida. The highest priced sedan is $900 to the carrier and the lowest $450. The average price is $700 to the carrier (add broker fee for actual total). The vehicles listed at $700 and higher are likely to ship within a week, and the very highest within a couple of days. Those vehicles less than $700 to the carrier are likely to take longer than a week, and some won’t ship at all. Remember this is October 2014 and auto transport prices may be radically different the following October, and most likely will be higher in December and January. So the advice to the customer is not to take the lowest price going to Florida in the fall and winter from the Eastern, Midwestern and Plain States. There are desperate car shipping brokers out there who engage in bait and switch tactics, so don’t bite. Hit the mean and if in a hurry go a little extra to jump ahead of the pack. The Direct Express Auto Transport quote engine, the original online, allows for that quite nicely. Our customers are very satisfied with how we handle shipments and pricing to Florida. The rest of the country has a kind of parity in the market, and car shipments tend to go smoothly. From the Southwest, Northwest and Western states the weather is moderate and vehicle shipments are generally on time. California has 12% of the US population and 13% of total vehicle shipments heading there. Texas is also in balance with 8% of the total population and 9% of the car shipments going there. Same holds true in the South, East, Midwest, Rockies and Plain States. A parity between supply and demand for truck space keeps the car shipping industry in balance. So the disparity that exists in October is a Florida phenomenon and the customer should feel confident that his or her auto shipment is likely to go well with a minimum of stress. If you would like to learn more about the auto transport industry, then please go here. Please remember that Direct Express Auto Transport has a history of providing the most accurate car shipping rates in the industry!